Consalvo Carelli was a member of a famous Neapolitan artist family: his father, Raffaele, his brothers, Achille and Gabriele, as well as his son, Giuseppe - were all artists. 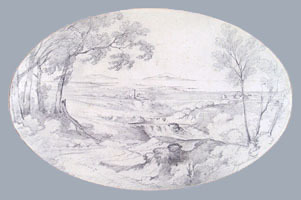 A pupil of his father and, then, of William Leighton Leitch, he debuted in 1830, twelve years old, at the Esposizione di Belle Arti in Naples, with two drawings. He counted among his friends and sponsors the banker Gustave Meuricoffre, Lord Essex, and the Duke of Terranova, who provided Consalvo a scholarship for Rome. In Rome he portrayed the countryside landscapes, scenes of everyday life and landscapes of his hometown. After four years he returned to Naples, before moving to Paris. Here he won the gold medal at the Salons des Art International for three straight years (1842-1844). He returned to Naples in 1845, in status of a famous artist. In 1845 the Russian ambassador to Naples, on behalf of the Tsar, commissioned two large paintings, depicting Neapolitan views, now in the Hermitage Museum. From 1859 he was a professor at the Instituto di Belle Arti in Naples; in 1862 he moved to Rome, becoming, in 1869, a court artist of Margherita di Savoia and, in 1874, a member of the Accademia di San Luca.